Build a community around the event in advance e.g. via the successive bio blog posts added each day for the two weeks prior to #SxSC2, and creation of #SxSC2 twitter lists to help attendees to follow other attendees and speakers before and after the event. Encourage attendees with no social media experience to learn more about it and, if wanted, provide a quick introduction to tools such as twitter. Provide practical support for extensive social media use e.g. charging stations, signs detailing hash tags etc. Create a social media archive of the event and demonstrate the potential of such an archive, particularly in the context of work by the Web Observatory and in relation to the JISC DataPool project. Encourage users to meet one-another physically, building on SM connections e.g. by printing SM icons on delegate badges. The #digichamps played a vital role throughout the #SxSC2 event, organising, training, capturing and editing content and developing the community. You can learn more about their activities on the Digital Champions pages. However, we didn’t manage to do everything that we planned. For example, we had hoped to print out emerging issues and enable users to meet physically in areas designated via hash tags used in the twitter feed. We could also have made far greater use of Leaderboarded.com’s extensive functionality as a means to add gamification components to #SxSC2. We had discussed various means to encourage physical meetings including use of mobile phone apps. to help serendipitous and deliberate encounters. Each of these will be explored further as we plan for #SxSC3. We are collating a list of #SxSC2 storifys. Photos from the event are available sotonDE flickr stream. You can access the #SxSC2 page on Leaderboarded.com. There is also a post by the leaderboarded.com team about the event. A total of 222 people registered to attend the #SxSC2 event and approximately 200 attended, with a quarter being external guests from a wide range of industries. The internal attendees came from across the University of Southampton. So far there have been 109 views of the http://i-catchingmovies.co.uk/ films (which are available at http://www.youtube.com/user/icatchingmovies). The streaming video during the event was watched at least 68 times. We have edited footage that can be viewed from SUSU.TV including recordings of all talks. We are exploring ways to link the video content to the social media content that surrounded it. The sotonDE blog received 554 new visitors in the week of the conference, and it crept onto the first page of a google.co.uk search for ‘digital economy’. During the event there were 59 shares of the live feed, 99 of the bio pages (in total), 144 of the programme of SxSC2 and 21 of the pre-event videos. “Below are some basic statistics, plus some network graphs of the Retweet and Mention networks. I’ve also included a ‘classified’ retweet network graph, which represents the highly retweeted, and well-connected users within the #sxsc2 conversation. More details of the methods employed are introduced in the following eprint. We are starting to hear about storifys being created for #SxSC2. Please contact us to add to the list below. Sage words from Mike Lister, one of the panel members at SXSC2. How many of us have been seduced into attending a boring meeting by the promise of a quality buffet or a glass of decent wine? Or maybe you’ve handed over your personal details to a website in exchange for a 20 per cent voucher off the price of something or other? Surely there’s no harm in Facebook, Google etc because they are useful services and, besides, they are free? The marketing guru added a commercial perspective to the discussions on the future of digital technologies. Earlier, keynote speaker and author of Digital Vertigo, Andrew Keen (who wasn’t too upset at being dubbed ‘the antichrist of the Internet’) called for us to “fight again the economy of free” and urged debate on new business models and the urgency for widespread data literacy, before all our personal information ends up in the virtual vaults of the big social media companies. He even asked us to think seriously about government restrictions on the free market of information. According to Mike, Facebook isn’t a social network, it’s an advertising stream: Google isn’t a search engine, it’s an avid collector of personal information for its own financial devices. According to Andrew, many web marketeers think ‘privacy is for old people – like a gas light, it will just fade away’. Food for thought? Prawn vol-au-vent anyone? You can read all the bios here. Ian Brown introduces the Web Observatory in advance of the #SxSC2 event. Dr Lisa Harris introduces the #SxSC2 event. Guy Stephens, Social Media/Enterprise Social Network Consultant at Capgemini. Guy has over fourteen years experience in the digital space, the last six or so focusing on social media. Guy has been described by Dr Dave Chaffey as ‘one of the world’s leading thinkers’ on the use of social media customer service, and was seen as an early adopter in this space by Business Week. While at The Carphone Warehouse he set up the use of social media within customer service, back in 2008. This work was written up in a Forrester Report – How Carphone Warehouse Uses Twitter And Social Media To Transform Customer Service. Guy currently works with large organisations to help them understand the business transformation challenges social media has on the way they engage with their customers, as well as the impact it has on the way they work and communicate. His work covers everything from designing social media command centres through to working with companies such as Yammer, HootSuite, GetSatisfaction and Salesforce. 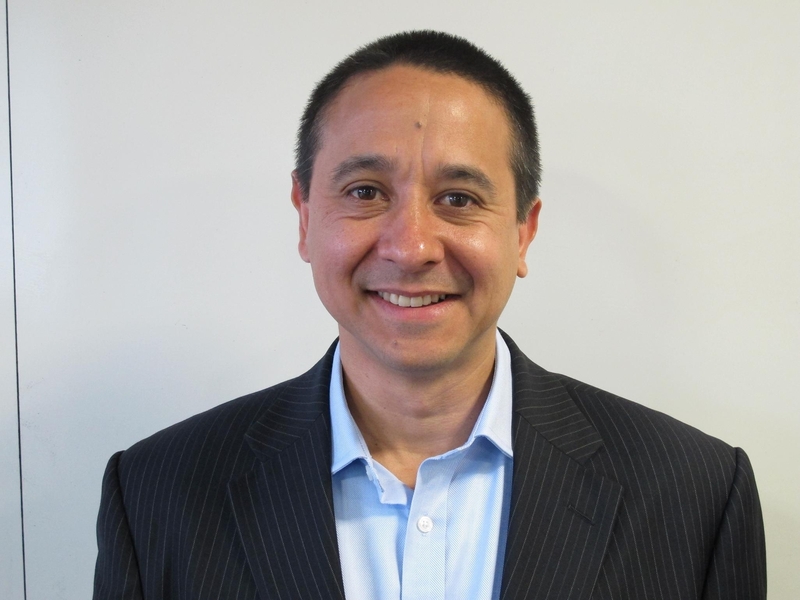 Guy also acts as a mentor as part of Capgemini University, a programme jointly run by the University of Reading and the Henley Business School. In addition, he also works with Behind the Screen, a project creating a new type of IT GCSE, to design the social media module. Guy is a committee member of Digital Surrey, advisor to Leaderboarded.com, founder of the Social Media Governance Forum, regular contributor to various publications, conference speaker, avid Tweeter and lazy blogger. 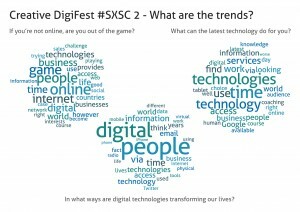 In what ways are digital technologies transforming our lives? We live in curious and somewhat paradoxical times. Social media is a proxy for change, disrupting established business models. On the one hand it is bringing a level of intimacy and humanity back into areas of the business such as customer service that have for decades been defined by Taylorism, and yet walk into any public space and we’re all consumed in our own little worlds tapping away on our smartphones or iPads. Intimacy on the screen, intimacy in a virtual space, alongside an ever-increasing sense of physical alienation. A world in which strangers are friends, privacy is characterised by apathy, convenience and cognitive polyphasia … as Clay Shirky writes – when we change the way we communicate we change society. What can the latest technologies do for you? Which game? Whose game? Who sets the rules? What are the rules? I’m reminded of Howard Rheingold talking about digital literacies – what skills plus social, do we need to survive? 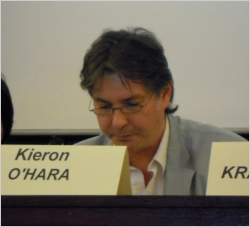 Kieron O’Hara is a senior research fellow in Electronics and Computer Science at the University of Southampton. His interests are in the philosophy, sociology and politics of technology, particularly the World Wide Web and the Semantic Web; key themes are trust, transparency, privacy and the use of technology to support human memory. He has had a central involvement in the development of the discipline of Web Science. He is the author of several books, including: ‘Plato and the Internet’ (2002); ‘Trust: From Socrates to Spin’ (2004); ‘inequality.com: Power, Poverty and the Digital Divide’ (2006, with David Stevens); and ‘The Spy in the Coffee Machine: The End of Privacy As We Know It’ (2008, with Nigel Shadbolt), as well as ‘A Framework for Web Science’ (2006, with Tim Berners-Lee et al), for the journal ‘Foundations and Trends in Web Science’. He has also written extensively on British politics and political theory, and is a research fellow for the Centre for Policy Studies, and a research fellow with CONCEPT: the Nottingham Centre for Normative Political Theory. He writes frequently for popular journals and newspapers, has appeared several times on radio and television, and regularly blogs for the Centre for Policy Studies. His latest book is ‘Huxley: A Beginner’s Guide’ (2012), and he is currently engaged in writing about online religious extremism. He chairs the transparency sector panel for crime and criminal justice for the Ministry of Justice and the Home Office. His report on privacy in the context of the UK government’s transparency programme, ‘Transparent Government, Not Transparent Citizens’, was published in September 2011. 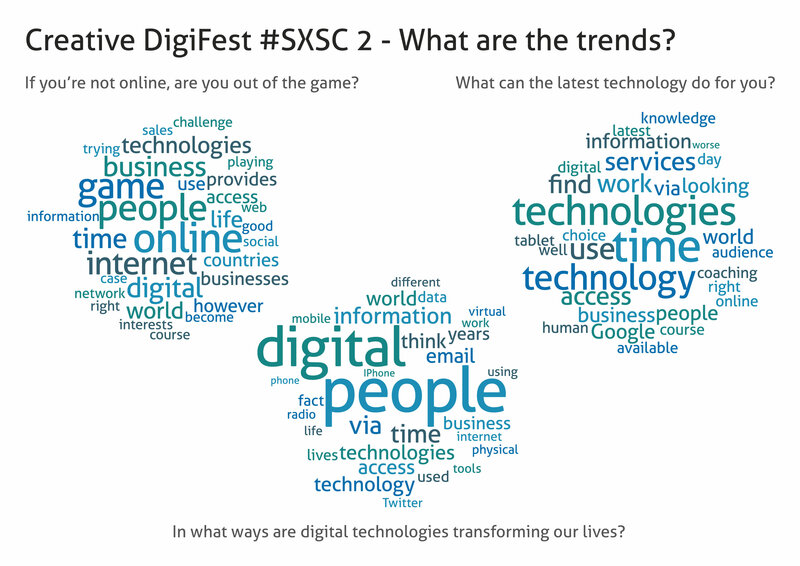 How are digital technologies transforming our lives? I think it’s pretty obvious how life (and reality) are being transformed – more information more easily available, more access to people, more traces of our activities left behind. Reality, for many people at least, is encompassing digital aspects. It seems clear, as a number of far-sighted thinkers always maintained, that a good many people can feel as warmly for, and interact as deeply with, digital artefacts or digitally-mediated traces of friends, colleagues and family as with the analogue versions. Is that surprising? Not really, when you consider how easily people have always moved between the symbolic realm and the symbolised. From the medieval days of minstrelsy, people have fallen in love with images of pop stars they have never met (and nowadays, people will pay good money to see a Robbie Williams imitator, who is aping Robbie Williams’ on-stage persona, which is presumably very different from the chap himself). People used to hoard things, then gold, then paper money, and now they get excited when a number which represents a stock market index or a growing bank balance increases on their computer screen. Sexual fetishism is the transfer of desire from a person to a representative, be it an article of clothing or the acting out of a type of scene. Art was one of the earliest human impulses – we don’t know the significance of cave paintings, but even if they were just Neanderthal wallpaper it’s remarkable that our ancestors were able to create and relate to arrangements of pigment that represented the animals they hunted (and, by the way, remarkable that they look like animals to us, too). Even some of the deepest, most treasured and valued feelings we have irrevocably involve symbols. The Host, when consecrated in the Eucharist, becomes something that people of many religions can relate to very powerfully – yet it is after all a piece of bread. Symbols live and sometimes they die when the social conditions that make them happen disappear – presumably the Greek gods were very meaningful at one time, yet now they have become myths, stories – culturally important but no longer moving or persuasive. So I don’t find it surprising that people can form or conduct relationships with remote people, or live in Second Life. Humans are meaning-makers – we create significance in our environment, and in the objects we engineer. Me personally, or an abstract person? Technology can bore people or excite them, make them more efficient, or distract them from their work, keep them in touch or lock them in a world of their own creation. I think the positive possibilities of new technologies are massive, and as usual after a period of reflection we’ll discover (a) that much of the potential we anticipated has not been realised, and (b) that we will count many unanticipated effects as positive outcomes. But I know from my own work as an academic how far access to information has completely transformed my work. If I were to focus on that aspect of life, I’d have to say that it is extremely exciting to be within reach of the work of so many knowledge creators. If Newton was standing on the shoulders of giants, heaven knows where that puts me. But of course technology can’t make you wiser or more reflective (or turn me into Newton, worse luck). If technology takes away from us the ability to sit back and gauge the significance of what we have discovered, then so much the worse. We need to use technology and make sure it does not use us (sorry for the cliche, but it’s true). Not sure what game that might be – but whatever it is, this had better not be true. If we make it impossible for people to pursue their own conception of the good life without Facebook or Google or an iPhone, then we will be diminishing our society by diminishing its scope. In any type of pursuit, there is usually a default mode of existence where most people are comfortable and which requires certain skills, commitments and technologies. Without those skills, etc, then you can’t join in. But that general consensus very rarely exhausts all the possibilities, and there are usually alternative ways of getting value out of life. Trying to close those alternatives down would involve an unacceptable level of coercion – but in any case we should support anyone trying to live life as they wish to, and not try to clone ourselves or our machines.